The course aims to give you an all round understanding of primates, including: different genre of primates, their behaviour in the wild, breeding, health, diet, conservation and managing them in captivity. You will learn about everything listed on the course description, carefully developed to fulfill the learning goals of each lesson.The level you should have reached in your understanding of primates, providing you complete the course as specified, is level 4 in the UK (level 5 in Europe). Therefore, you will not just be getting a superficial grounding in primatology like many courses offer. You will be getting a deeper level of knowledge and just as importantly, transferable skills in dealing with primates. You will also see from the course description that Primate Naturalist: Karin Saks, is currently studying this course, to formalise her already extensive knowledge of primates. Karin's charity offers opportunities for those having a keen interest in primates, to join her in researching vervet monkeys in South Africa. Please let us know if you would like us to pass your details on to her. Thank you for your message. Please don't worry because you don't need any qualifications or previous experience to do our course. You can select study option A if you want an endorsed qualification from an Ofqual Recognised Organisation, for employment purposes for example.There is a final exam for this option. You can select study option B and save £15.00, if you just want to learn about primates for interest purposes. You are not required to take an exam for this option and you will receive a Certificate of Completion from us. If you would like hands on experience of working with primates in the wild, Karin Saks is a current Primatology student with us and is a Primate Conservationist working in the field. You are welcome to watch her online video: Co-existing Peacefully With Baboons/Monkeys and read her Blogspot on the Samango Monkey Project. If you want to support Karin in her work through a work experience holiday, please contact us and we will happily pass your details on. Alternatively, you can contact Karin yourself. The course will give you transferable knowledge that you can pass on to others and how much knowledge you gain, will depend on how deeply you delve into the subject. You should look upon how the course works, as being similar in some regards to doing a degree. Lessons for the course begin with a set aim plus background reading of the notes that provide a foundation for each lesson. After the reading, you will undertake a set task that may include further research, networking, problem solving, or looking at things from different perspectives. After this, you will submit a written assignment, which is marked and graded by your tutor and then sent back to you with any helpful and relevant comments. Finally, once you have completed all the lessons and assignments, there will be one final one-and-a-half hour exam, taken at a time and place of your choosing. This experientially based teaching method will help you to learn in three important ways; by reading, researching and reporting (ADL's three "R"s). The 100 hours given for the duration of the course is a guide only, because many of our students control their depth of learning by getting really involved with the subject matter, in order to learn as much as they can. For this reason (among others), we do not set any deadlines, or an end date by which the course has to be completed. To do so, would seriously curtail some students' learning capacity and we will not do that. So, the course provides the framework and the structure, that will enable you to learn a great deal, which should enable you to teach others what you have learned, plus the practical application. We are very happy to provide an example from the course, but it should be looked at from the perspective of being factually correct and easy to understand. Because of how the course works, it would not be representative of everything you will learn, because the reading is only part of it. I am in the U.S. and interested in purchasing this course. As the price of the course is in British pounds, can I pay in U.S. dollars? Hello Mecca and thank you for your question. You sign up as per the price on the website in sterling and your bank will convert what you have paid in sterling to dollars and debit your account accordingly. I hope that this answers your question okay. ( jude roycroft, 28/02/2014 ) Q: I have volunteered with orangutans in borneo for a year, vervets and baboons in south africa, would you recommend this course. 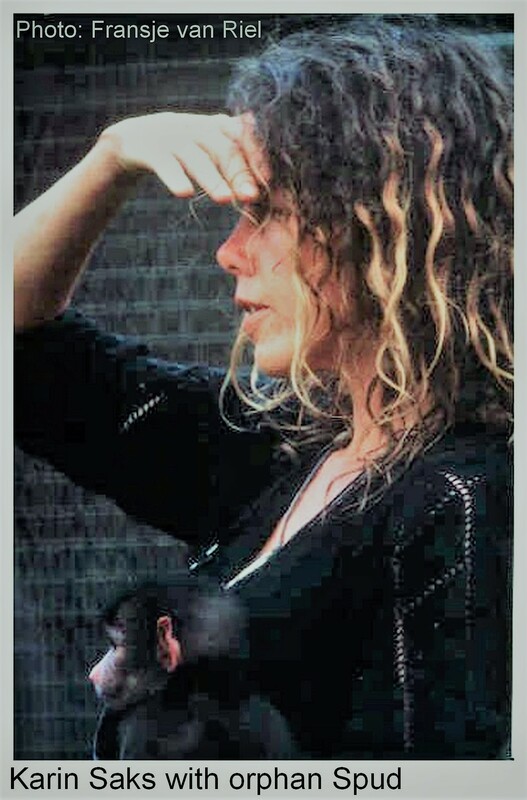 Currently we have the Primate Naturalist: Karin Saks, studying this Primatology course. Karin has been fostering and rehabilitating orphan baboons, caring for injured monkeys returned to the wild, plus promoting a harmonious co-existence between primates and humans since 1997. She also founded The Darwin Primate Group as a non-profit organisation in 2008 and in 2014, moved to Kwazulu Natal to research the endangered samango monkey populations in the Midlands. New Post on Samango Monkey Research Project: Can the Vervet Monkey and Samango Monkey Hybridise? As you can see, our courses are highly respected by conservationists actually working in the field to help save the wildlife of our world, so you really can trust ADL to help you develop the knowledge and skills, you need to get involved in the environmental welfare of animals. What are the benefits of living in groups for primates? 8. Conservation in the wild -of individual breeds? What Animals are most Endangered? Please note: Each lesson culminates in an assignment which is submitted to the school, marked by the school's tutors and returned to you with any relevant suggestions, comments, and if necessary, extra reading.